Ficus includes 800 species that is found in most tropical zones all over the world. Ficus benghalensis (Moraceae) is one of them and it is a large evergreen tree 23–34 m tall  that is found in south and southeast of Iran as wild and cultivated plant. Various studies show that different parts of this plant can be effective as traditional medicine because of the presence of different chemical constituents such as triterpenoids, flavonoids, tannin, different glucosides, steroids, resin, albumin, and malic acid., Methanolic extracts of root, bark, and leaf of F. benghalensis were studied for antimicrobial effects, and all three parts of plant extracts inhibited the growth of Gram-positive bacteria as well as Gram-negative bacteria. Among the tested microbial strains, bacteria were found to be more sensitive than fungi. The methanolic extracts of root and leaf are potent against Candida albicans. This plant has antipyretic activities, analgesic effects, antitumor activities, and anti-inflammatory  activities. The bark of this plant has anti-inflammatory and analgesic properties in animal models, and it is useful for burning sensation, ulcers, and painful skin diseases. The aqueous and methanolic extracts of this plant kill the earthworm and it was comparable by antihelminthic drugs. Antidiabetic activity of the aqueous extract of F. benghalensis at a dose of 500 mg/kg/day was shown with histological studies in normal and streptozotocin-induced diabetic rats. Indian researchers study various biological activities of different parts of F. benghalensis. This plant is one of the Iranian traditional medicine that is used in different traditional formulations There is not enough study about Iranian kind besides useful uses of it. Therefore, the aim of this study was preliminary phytochemical screening and investigation of antioxidant activity of Iranian F. benghalensis root as a traditional medicine for comparing with Indian kind to further pharmaceutical investigations. The roots of F. benghalensis were purchased from botanical market of Tehran. The dried roots (300 g) were powdered and extracted by ethanol 80% in percolator at room temperature (3 × 48 h). The extract was concentrated using a rotary evaporator at 37°C (190 g). Twenty-nine grams of dried extract was fractionated based on increasing polarity by chloroform, ethyl acetate, and methanol at room temperature by silica gel (mesh 35–70) and filtration set. The different fractions were concentrated using a rotary evaporator at 37°C. All fractions, i.e., chloroform (8.3 g), ethyl acetate (5.5 g), and methanol (7.1 g), were stored at 4°C until use. 2,2-diphenyl-picrylhydrazyl (DPPH), butylated hydroxyanisole (BHA), and 2, 4, 6-tripyridyl-striazine (TPTZ) were bought from Sigma-Aldrich (Germany). Sodium carbonate, sodium acetate, ferrous sulfate, and FeCl3 were prepared from Scharlau, Spain. Other chemicals and all solvents were purchased from Merck (Germany). Inhibition % = 100 – ([Sample absorption − control absorption]/Blank absorption) × 100. The total extract and different fractions of the plant were used for preliminary phytochemical screening that is shown in [Table 1]. All results are reported in [Table 2]. IC50 value is the concentration of sample required to scavenge 50% of DPPH-free radical and was calculated by plotting a graph of concentration and % inhibition. The calibration curve for the quantification of DPPH assay was linear over the range of standard concentrations of 500–2000 μg/ml with correlation coefficient of R2 = 0.957 about the validity, accuracy, and precision of the method being also in the acceptable range. Methanolic fraction was more effective than the others. All results are reported in [Table 3]. Calibration curve of standard solution of sulfate iron is shown in [Figure 1]. 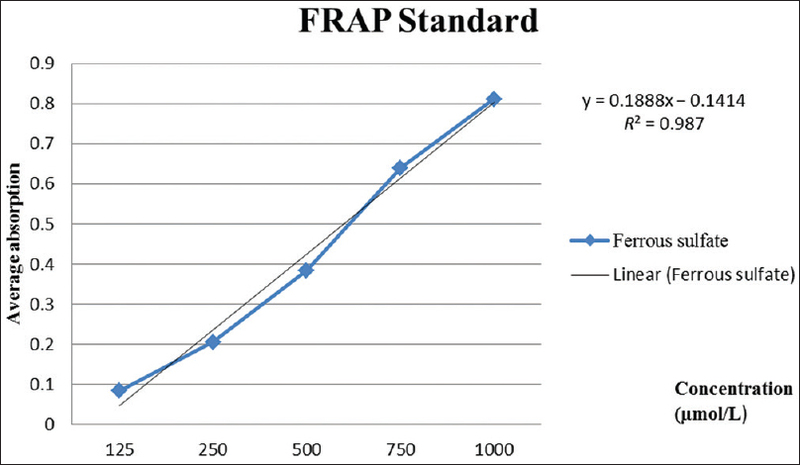 The calibration curve for the quantification of FRAP assay was linear over the range of standard concentrations of 100–1000 μM/L with correlation coefficient of R2 = 0.987 about the validity, accuracy, and precision of the method being also in the acceptable range. Ethyl acetate fraction was more effective than the others. Ficus species are rich source of natural antioxidants. There are different researches about antioxidant activity of different parts of this genus. F. benghalensis is one of the species that Indian researches worked on it. One study elucidated that the aqueous extract of F. benghalensis Linn. root had maximum scavenging of DPPH radical (96.07%) at 250 μg mL −1 concentration and hydrogen peroxide (69.23%) at 1000 μg mL −1 concentration. The methanolic extract of roots of this plant showed good antioxidant activity by reducing power assay and hydrogen peroxide assay with IC50 value 27.5 and 25 μg/ml, respectively. One study evaluated that methanolic extract of F. benghalensis aerial roots had immune stimulatory activity with specific and nonspecific mechanisms, which may be due to the presence of prominent amount of flavonoids, phenols, and tannins. The antioxidant and immunomodulatory activities of F. benghalensis leaves fractions were evaluated, and this article indicated that the radical scavenging effects of fractions on DPPH were less than reference antioxidants and the n-hexane fraction showed the best activity. In this study, the different fractions of Iranian aerial root showed antioxidant activity, but this effect is less than the Indian kinds. Preliminary phytochemical screening showed that the roots of this plant have different constituent such as steroids, tannins, phenolic compounds, and flavonoid glycosides as the Indian kind. The methanolic fraction has the best antioxidant activity by DPPH assay, and ethyl acetate fraction has the best ferric reducing power. This ability happens because of the presence of different constituents such as phenolic compounds, flavonoids, and tannins in this plant. Another study will need for accurate elucidation of its chemical constituents. The present studies indicated that Ficus benghalensis root could be useful as antioxidant constituents in pharmaceutical industries. This study was supported by International Campus, Tehran University of Medical Sciences (Thesis Code: 8923120022). Subramanian PM, Misra GS. Chemical constituents of Ficus benghalensis (part II). Pol J Pharmacol Pharm 1978;30:559-62. Elias NY. Antimicrobial Activity of Ficus benghalensis in Cosmetic Application. Thesis of industrial utilization of medicinal and aromatic plants of the University of Sri Jayewardenepura, 2010. p. 10-91. Govindarajan M. Larvicidal efficacy of Ficus benghalensis L. plant leaf extracts against Culex quinquefasciatus say, Aedes aegypti L. and Anopheles stephensi L. (Diptera: Culicidae). Eur Rev Med Pharmacol Sci 2010;14:107-11. Vikas V, Patil BS, Narkhede SB, Jawle NM, Patil VR. Analgesic and antipyretic activities of Ficus benghalensis bark. Int J Pharm Res 2010;2:526. Shukla R, Gupta S, Gambhir JK, Prabhu KM, Murthy PS. Antioxidant effect of aqueous extract of the bark of Ficus benghalensis in hypercholesterolaemic rabbits. J Ethnopharmacol 2004;92:47-51. Patil VV, Pimprikar RB, Patil VR. Pharmacognostical studies and evaluation of anti-inflammatory activity of Ficus bengalensis Linn. JYP. 2009;1:49-53. Jaiswal R, Ahirwar D. A literature review on Ficus bengalensis. Int J Adv Pharm Res 2013;5:57-61. Aswar M, Aswar U, Watkar B, Vyas M, Wagh A, Gujar KN. Anthelmintic activity of Ficus benghalensis. Int J Green Pharm 2008;2:170-2. Gayathri M, Kannabiran K. Antidiabetic and ameliorative potential of Ficus benghalensis bark extract in streptozotocin induced diabetic rats. Indian J Clin Biochem 2008;23:394-400. Das K, Tiwari RKS, Shrivastava DK. Techniques for evaluation of medicinal plant products as antimicrobial agent: Current methods and future trends. J Med Plants Res 2010;4:104-11. 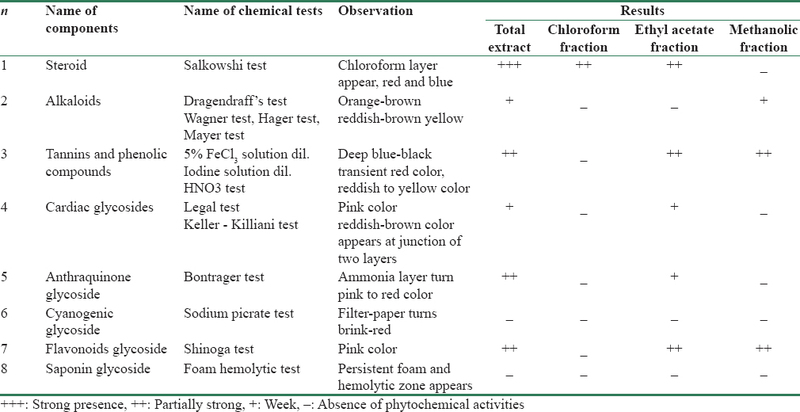 Tiwari P, Mandeep BK, Kaur G, Kaur H. Phytochemical screening and extraction: A review. Int Pharm Sci 2011;1:98-106. Harborne JB. Phytochemical Methods: A Guide to Modern Technique of Plant Analysis. ed. 3. New York: Chapman and Hall Co.; 1998. p. 1-302. Sahira Banu K, Cathrine L. General techniques involved in phytochemical analysis. Int J Adv Res Chem Sci 2015;2:25-32. Jaradat N, Hussen F, Al Ali A. Preliminaryphytochemical screening, quantitative estimation of total flavonoids, total phenols and antioxidant activity of Ephedra alatadecne. J Mater Environ Sci 2015;6:1771-8. MacDonald-Wicks LK, Wood LG, Garg ML. Methodology for the determination of biological antioxidant capacity in vitro: A review. J Sci Food Agric 2006;86:2046-56. Sarker SD, Latifi Z, Gray AI. Natural Products Isolation. New Jersey: Humana Press Inc.; 2005. p. 23-30. Khosravi Dehaghi N, Gohari AR, Sadat-Ebrahimi SS, Naghdi Badi H, Amanzadeh Y. Phytochemistry and antioxidant activity of Lallemantia iberica aerial parts. Res J Pharmacogn 2016;3:27-34. Heinonen IM, Lehtonen PJ, Hopia AI. Antioxidant activity of berry and fruit wines and liquors. J Agric Food Chem 1998;46:25-31. Sirisha N, Sreenivasulu M, Sangeeta K, Madhusudhana CC. Antioxidant properties of Ficus species – A review. Int J PharmTech Res 2010;2:2174-82. Gupta VK, Sharma SK.In vitro antioxidant activities of aqueous extract of Ficus benghalensis Linn. Root. Int J Biol Chem 2010;4:134-40. Anarthe SJ, Pravalika A, Malavika E, Raju MG. Assessment of immunomodulatory activity of Ficus benghalensis Linn. aerial roots. Int J Pharmtech Res 2016;9:153-63. Bhanwase AS, Alagawadi KR. Antioxidant and immunomodulatory activity of hydroalcoholic extract and its fractions of leaves of Ficus benghalensis linn. Pharmacognosy Res 2016;8:50-5.